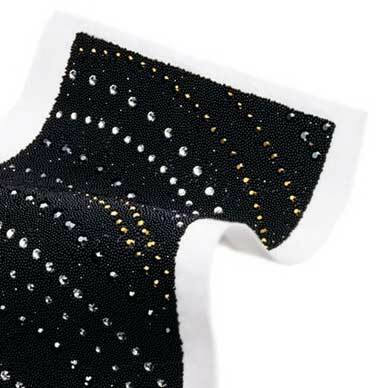 Swarovski's Crystal Transfabric is a marvelous fusion of the elegance & sophistication that comes from its Crystal Fabric with the glamourous glitter of its reknown XILION Flat Backs. Comes in a large variety of colours and sizes. Excellent for plenty of design possibilities. You can integrate the design into a print or patter, use this instead of a seam, embellish special pieces for a completely different look. Can also be combined with embroideries or used with other Crystallized™ - Swarovski Elements. We will collect a list of Swarovski Crystal Transfabric items here for your easy reference. They will be sorted by their Codes. Not every item has a name but when they do, we will include it. Click on the code-link for more details of each item of Crystal Transfabric.